A "pumping" all-in-one pre-workout powerhouse, the all new Shock Therapy does away with flat, lifeless workouts and zero motivation and drive. Combining patented ingredients and proven performance compounds in adelicious, sugar-free formula with cell volumizers, energy substrates, focus agents, a new creatine complex, antioxidants and more, this comprehensive supplement will give you powerful pumps and lock you in the zone and help you dominate in the gym. 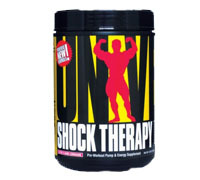 With the anabolic nutrients of the Shock Therapy formula coursing through your veins, your "pumps" will be insane. Freaky. Vascular. Intense. For a bodybuilder, the pump is everything. Just ask Arnold... He knows the deal. Volumized. Energized. Powerized. Primed to perform. The best workouts of your life. All just one delicious serving away. So chug away before you lift with the brand new, completely overhauled Shock Therapy. INGREDIENT NOTES: Sustamine is a registered trademark of KYOWA HAKKO BIO Co., Ltd. GlycoCarn and ArginoCarn are registered trademarks of Sigma-tau HealthScience and are manufactured exclusively worldwide under USA production patent #6703042 and worldwide production patent EP1202956. Creatine MagnaPower is a registered trademark of Albion Laboratories, Inc., and is covered by U.S. Patent #6,114,379 and patents pending. Recommended Use: As a dietary supplement, For performance enhancement use 30 minutes preworkout. Depending on factors such as bodyweight, experience and stimulant tolerance, use 1-2 scoops per training session. Athletes weighing more than 200 lbs may require 1.5 to 2 total scoops. Always start with a single scoop (or less) serving in order to assess individual tolerance. Do not exceed 2 scoops in a single 24–hour period. Do not take within 6-8 hours of bedtime.